Well, I've been busy the last while! There's been a lot of things happening on my end creatively, but very little that would work its way around to an interesting blog post. That said, I have managed to make time for more photos! 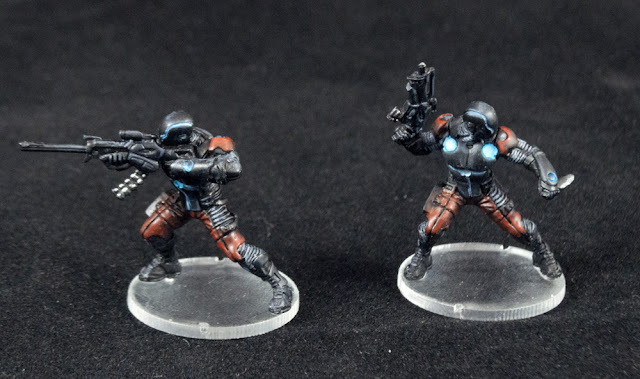 Next up from Icestorm are the Spektrs. They're infiltration specialists, equipped in O:IS with combi-rifles and blades, though also able to take boarding shotguns (very scary) and mines. Their true advantage in the game though is Thermoptic Camo, or camouflage that renders them invisible from both the chromatic spectrum, and the infra-red. (They never say whether or not it helps with UV, but who knows!) If you want an idea of what this is like, Ghost in the Shell makes great use of it. 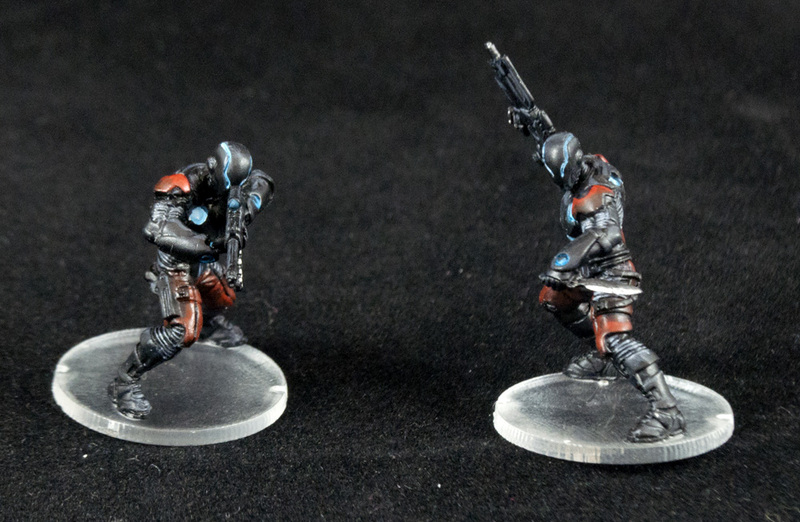 In-game, they're stealthy units that aren't ninja. They're far better at range than close-quarters combat, but boy will they be a nuisance for your opponent to take care of. Coming from Tunguska like the Grenzers, I had to go with a similar moody scheme. The default scheme puts a lot of white on them, which to me just means really obvious head target as soon as the camo goes down. 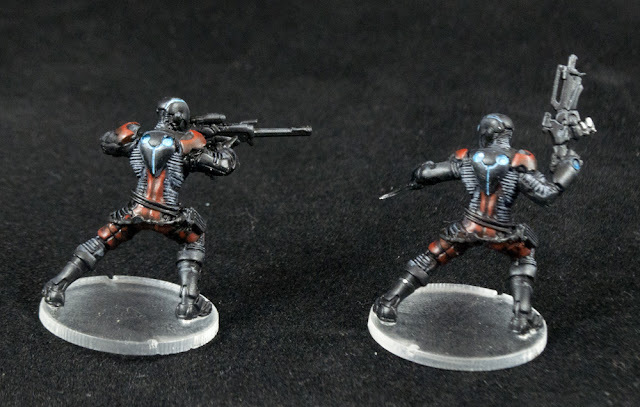 I went again with a more muted red, a shiny black, and despite my protestations against elsewhere, glowy bits. In this case, my assumption is the glow is the TO Camo device's output. They again are somewhat boring in paintscheme, but I'd much rather have them somewhat boring but logical, rather than crazy colours and silly as a result. I figure Nomads, especially Tunguskans, are no-nonsense sorts. You can see I've even done a black blade except for the razor cutting edge for the one to the right. Also visible here is my conversion of a Spektr with Sniper Rifle. I've pulled the other arm set from the Grenzer, kept the shoulderpads, and, thanks to a wonderfully adaptable body pose, made the second Spektr look like he's leaning into a shot. Possibly over a building parapet, possibly around a corner... The head realignment went easier than the arm adjustments, and saves me from having to use the Jethro Tull Sniper (the old Spektr) which is a pose that gets more bizarre the more you look at it! We're coming to the end of what I have finished painting shortly! I guess I'll have to pull out the brushes and paint soon, get some more finished off. In the meantime, enjoy and keep painting!